When I lived in my last Vanagon and traveled all over the US for 6 months, Santa Cruz, one of the first places I stayed, was my all time favorite. Sure, it is a beautiful little city and the coffee and cookies at Verve Coffee are so good I went out of my way to stop there this time around; but the best part of Santa Cruz was the “office”. In 2012 it was the West Cliff. At 6am or so each morning I would wake up, drive the van up to the West Cliff and secure a good parking spot for the day. Brew up some coffee, open the door, and commence work. 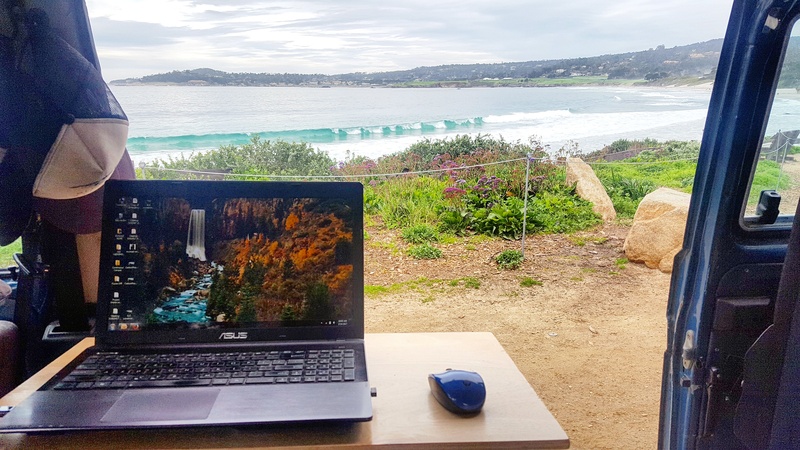 The view was unbeatable, and when you got tired of working and needed a break, simply close the door and voila – you are at the beach! Today was no different. This time I am staying a couple nights in Monterey. My host, who also owns a VW van and works remotely, took me over the hill to Carmel to one of his office spaces. Note, I had never been to Carmel, and instantly, I knew I was outside my pay grade. While the homes were not mansions, they were beautiful. We wound along this slow road that runs along the shore just south of town till we found a great spot, complete with bathrooms. I spent probably 5 hours there today; door open, laptop up, plugged into my solar grid, and working away. People would stop by off and on, peer in, and comment about my amazing office space. I love the people’s reactions when they glance over and see what is going on. Dog lazily stretched out on the couch, me with my laptop being the only thing between me and the outdoors. There is truly no better place I can imagine working.